James Priest and Sarah Mercier shone again and repeated their race victories from the series opener 3 weeks ago but while a resurgent Andrew van Kints pushed Priest all the way in the 4 mile event Mercier was a clear third overall in the 130+ field and had an easier ride on her way to a women’s win. With maximum points from the opening two events both winners are in strong positions to claim their respective Men’s and Women’s FNB XC Series titles. In fourth place overall Chris Gillman picked up good points and with several athletes missing this event looks likely to challenge for the overall podium. Last year van Kints was in the striped vest of Cheltenham for his first race on Guernsey soil and there was something poignant that for his last race on local soil he donned a Guernsey vest – near identical bar the colour of the stripes – the former RAF man will move from his post as a pilot at Specsavers and take a new role based in the Antarctic. 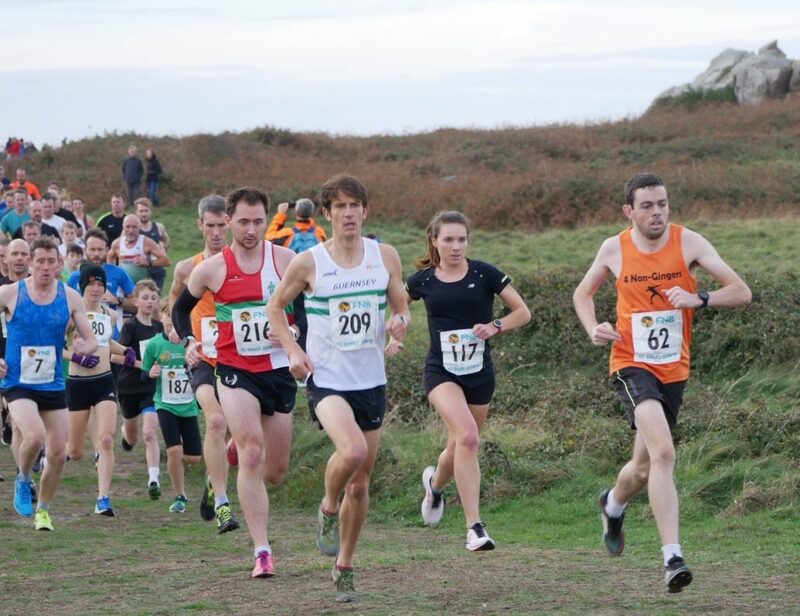 Phil Nicolle’s image captures him (209) alongside Will Bodkin (216, 5th), Mercier (117) and Priest (62). Louise Perrio was somewhat down on her best but still placed second woman albeit nearly two and a half minutes behind the category winner. Emily Bookless was a further 2 minutes behind in third. Under 15 athlete Gian-Luca Robilliard was first across the line in the supporting 3 mile event from fellow age-groupers Jack Le Tissier and Ryan Moroney. 14-year old Summer Woodhead was a runaway winner of the 2 Mile event from Rupert Wilson and Tilly Beddow. A big thank you to all the volunteers who ensured this event went ahead. Course Setup and Takedown :- Danny Blake, Tom Nichols, George Nichols, James Priest, Michael Way, Mel Nicolle, Phil NIchols, Carl Holden , Ray Scholes, Mikey Ingrouille, Nick Marley. Officials:- Louise Perrio, Alun Williams, Nick Marley, Tracey Marley, Suzi Druce, Paul Ingrouille, Hazel Solway, Linda Moroney, Sam Lesley, Steve Mann. Canteen:- Gina and Alan Rowe, Jeanne & Ove Svejstrup, Pete Wickins, Shelley Blake.